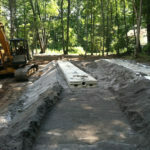 River Valley Construction, LLC offers residential and commercial septic system installation, repair and removal throughout Connecticut. The property’s septic system is essential to the health of the property. We are proud to offer septic system installation, removal and septic system repair services. We offer full installation services, from excavation to the installation of the septic system. We also offer trucking services to relocate any unwanted dirt. As a fully licensed, insured and bonded company, we combine the best equipment and cutting-edge technology along with our extensive experience to guarantee that your job is done in a timely and efficient manner.